I found this recipe in a book of Greek recipes called Taking you Home that I borrowed from the public library. 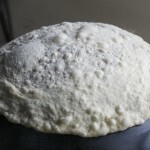 It’s not proper pita bread because it doesn’t contain any yeast and when cooked it doesn’t form a pocket. 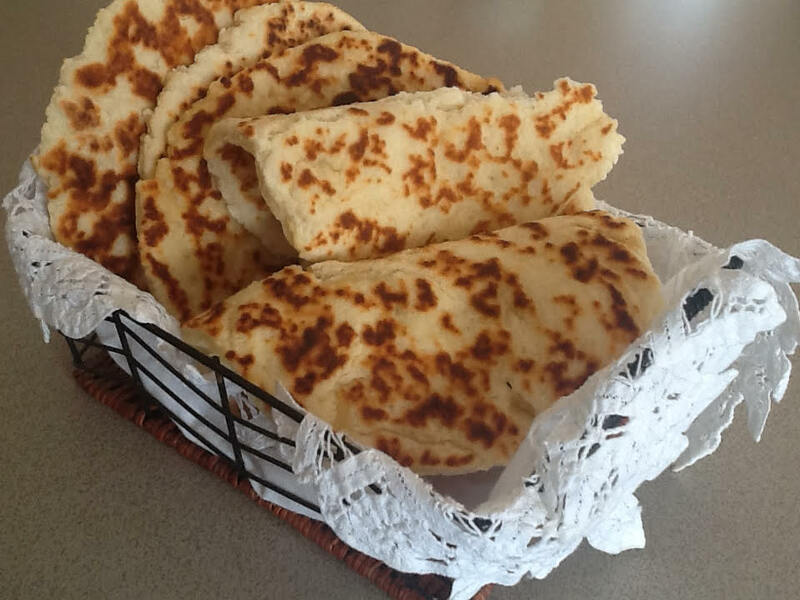 To make proper pita bread use this recipe. However, they taste good and you can make them in less time than it takes to nip down to the shops and buy some. A great accompaniment to dips and to serve at BBQs. Another big plus is that they reheat extremely well the following day in the oven, in a frying pan or in the toaster. The original recipe calls for 500g self-raising flour and 500g Greek yoghurt, plus a tablespoon each of baking powder and salt. I decided to make just over half the recipe and next time I will cut down on the baking powder and salt as they were a bit too overpowering. My adjusted quantities are below. They would make perfect individual pizza bases. Mix flour, yoghurt, salt and baking powder in a bowl until combined. If it seems too stiff add 1 or 2 tablespoons of water – just enough to get it all to stick together. 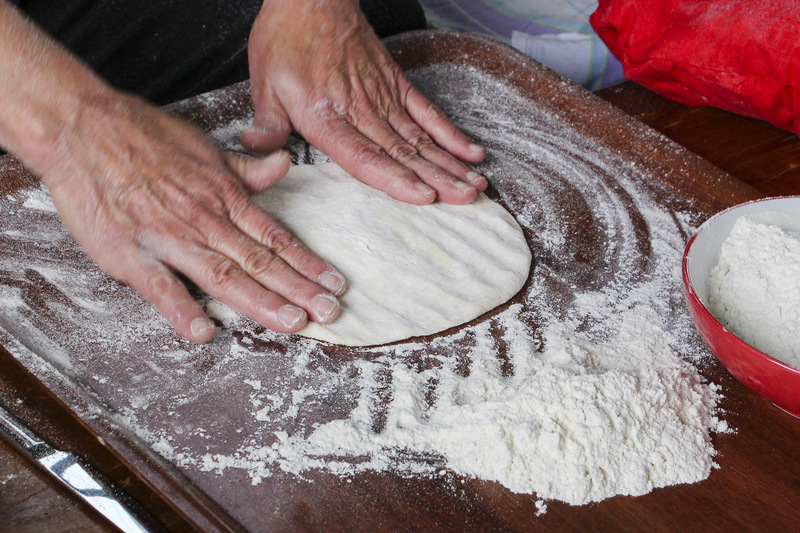 Tip onto a floured surface and knead gently for 30 seconds – just enough to get it all combined. 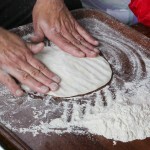 Cut dough into six and with a floured rolling pin roll each piece into a circle about 15cm (6 inches) in diameter. If you want them smaller cut dough into 8 or 10 pieces. Heat a non-stick frying pan over medium heat and spray the bottom with oil. Cook the pita for about 2 minutes on each side, or until nicely browned. Cook remaining pitas, making sure you spray each side with oil. Note: store any leftover pita in a plastic bag in the fridge. Reheat for a few minutes in a moderate oven or for a minute or two on each side in a dry frying pan. Or cut them in half and zap them in the toaster. There’s nothing quite like home-made Hot Cross Buns for breakfast over the Easter weekend. Serve them warm straight from the oven. Or make them ahead and reheat them in a moderate oven. Or split and toast them. 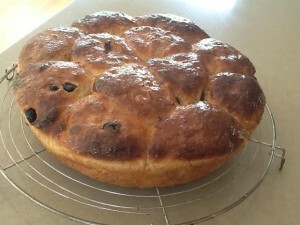 In an attempt to save time I thought I would see if the No-Knead Bread recipe could be adapted to make Hot Cross Buns. You always need more yeast when you’re adding fruit, sugar, butter and eggs to a basic bread dough, so I doubled the amount used in the No Knead Bread recipe. Putting crosses on the buns is a bit fiddly so I didn’t bother and can assure you they taste just as good without! Technically this recipe is not quick because you leave the dough to prove overnight. But the actual work involved takes no more than five or ten minutes. 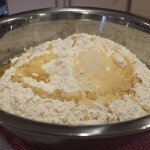 In a large mixing bowl mix all ingredients for yeast mixture with a spoon until well combined. Cover bowl with plastic wrap and leave overnight. 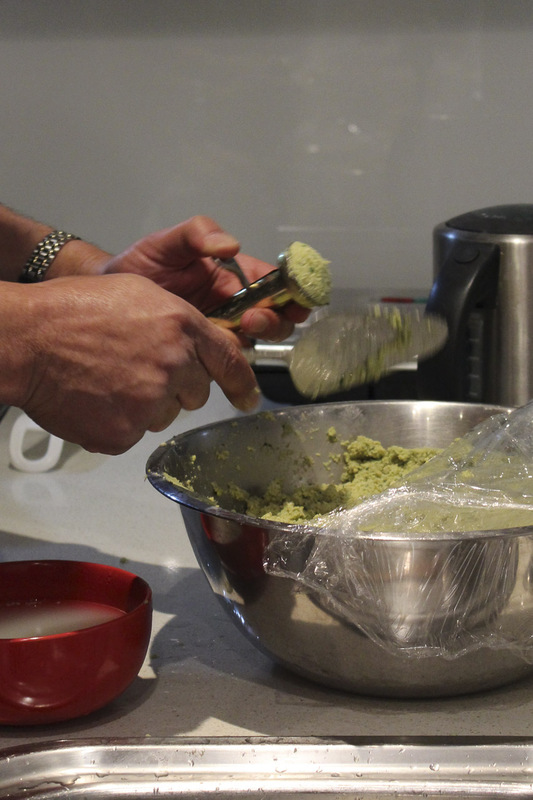 Next day – whenever you are ready – mix butter, sugar, spices and egg into the yeast mixture, using electric beaters. Lastly mix in the fruit then tip mixture onto a well-floured surface. Knead just enough to incorporate a bit more flour and get rid of excessive stickiness, then cut the dough into 12 even pieces. Form into balls and arrange in a greased 10-12″ (25+cm) round tin or use a rectangular one. Leave to rise for an hour or two, then bake in a pre-heated oven at 220ºC for 20 mins. Remove from the oven and brush with hot glaze while hot. Serve warm or toasted split in two and spread with butter. Glaze: place cold water and sugar in a small bowl and sprinkle with gelatine. Zap in the microwave for 20 secs on High. Note: can be frozen, but best frozen without glaze then thawed, reheated in a moderate oven and brushed with glaze while hot. Made in this way the buns all stick together and need to be broken apart. If preferred bake them on a larger biscuit tray, leaving more space between each one, so they don’t stick together. 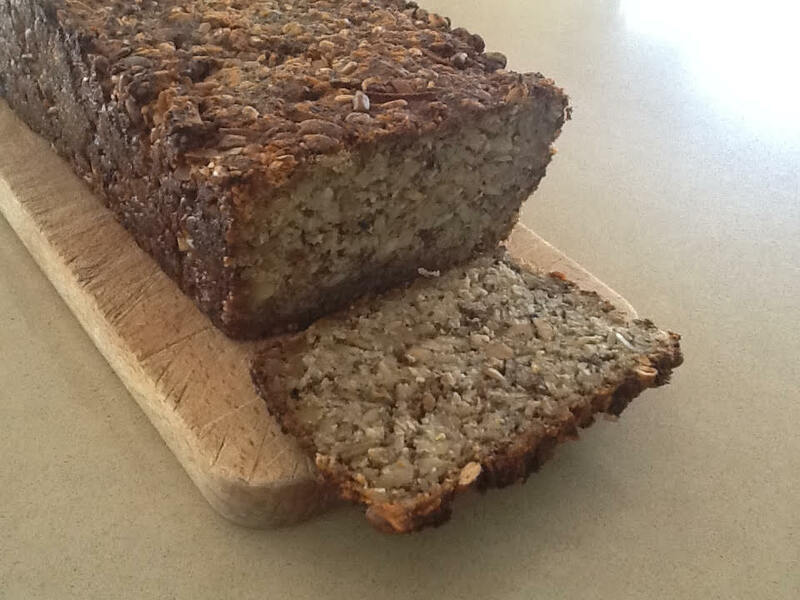 While were were living in Denmark I became very fond of Rugbrød, a dense brown bread which Danes eat with everything. I think it goes particularly well with smoked salmon, gravlax and cheese. Traditional Rugbrød is made from a sourdough starter, so it’s not exactly a five minute job. This recipe is similar in style, being dense and full of healthiness, but it uses self-raising flour and buttermilk as raising agents, so it is a five minute job – apart from the baking time. For a darker bread use treacle or molasses instead of honey. The soaked buckwheat keeps it nice and moist, so it lasts a few days in the fridge, well-wrapped. It also freezes well. I used one large tin and three smaller ones. My loaves weren’t very deep so I probably should have used one tin less in order to make them deeper. Serve with smoked salmon, Gravlax with Mustard Sauce or an aged cheddar or Brie. 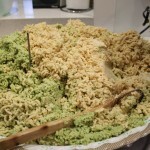 Place buckwheat in a bowl and cover generously with cold water. 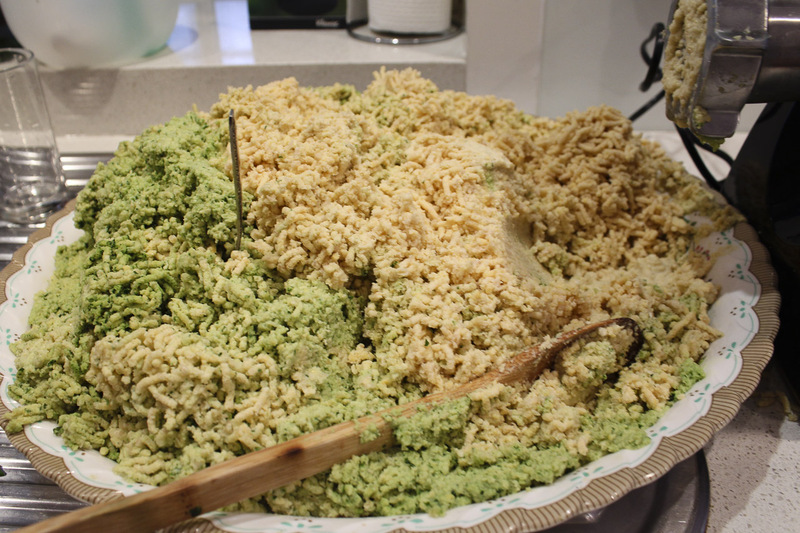 Leave to soak overnight then tip into a sieve, rinse under cold water and drain well. Preheat oven to 190ºC. Grease two loaf tins (or four small ones) with oil or butter. Place all ingredients in a bowl and mix well. Add a dash of cold water to the buttermilk container (about ¼ cup) and swish it around then add to the bowl. If there are any dry bits in the bottom of the bowl which won’t mix in add a little more water, but go easy. Mixture should be like a stiff scone mixture. Divide mixture among the tins which should be just over half full. Bake for 15 mins then lower temperature to 170ºC and bake for a further 35-45 mins. Larger loaves will take longer than smaller ones. It’s nice warm but easier to slice when cold. Can be toasted. A carton of buttermilk will keep in the fridge, unopened, for at least a month, so I always have one on hand to make Irish soda bread. This bread doesn’t contain yeast, so it’s quick to make. Delicious eaten fresh or toasted next day. 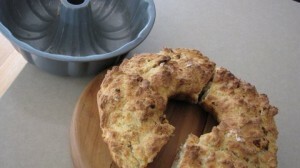 The owner of a bed and breakfast near Cork many moons ago taught me to make soda bread. She used sour milk – something people often ended up with in the days before refrigeration, when the recipe originated. As far as the method goes, our lovely Irish hostess said “just mix it up wit yer two hands”. As it’s a bit sticky, I usually use a spoon. I replace the sour milk with buttermilk, but a mixture of half plain yoghurt and half fresh milk also works well. You can use self-raising flour or plain flour with the addition of baking powder and bicarbonate of soda. This is a very flexible recipe. Use white flour or wholemeal as I have with these rolls, or half and half. Leave out the oats and use more flour. If you like, add a little honey. Grated cheese, herbs, chopped sun-dried tomatoes, dried fruit or nuts also help to ring the changes. 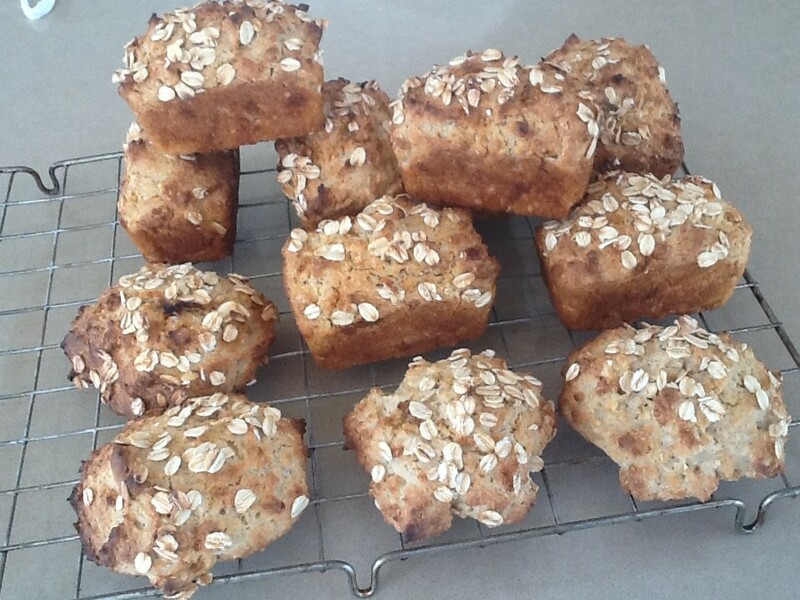 Top with oats, sesame seeds or poppy seeds. The options are endless. 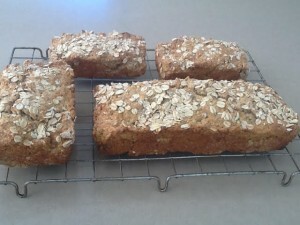 The recipe makes one large loaf or about a dozen small rolls. I recently bought a baking mold for 8 tiny loaf shapes and was dying to use it, so I ended up with eight loaves and four round rolls. 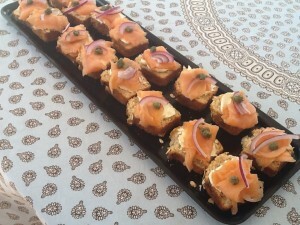 As you can see in the photo, I sliced some of the loaves and topped them with cream cheese, smoked salmon, capers and red onion. Delicious. Preheat oven to 200ºC. Mix all the ingredients in a bowl. I usually add a dash of water to the buttermilk container, swish it round and add that too. The mixture should be soft and slightly sticky – not as dry as a normal bread dough. Don’t over mix or knead. Place heaped tablespoonfuls onto a tray lined with baking paper. Or spoon into greased muffin tins or mini-loaf tins. Sprinkle with extra oats. 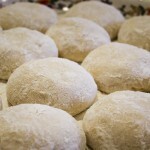 Alternatively, to make one large loaf, tip dough onto a floured surface and use floured hands to form it into a flattened round shape, place on a baking sheet lined with baking paper or in a large greased loaf tin and sprinkle with extra oats. Bake for 20-25 minutes, then remove from oven and cool on baking racks. A large loaf will take longer than rolls – around 45 mins. Notes: You can use quick cooking oats or ordinary stone-ground ones. 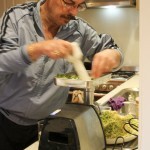 If using the latter give them a quick whiz in the food processor, to break them up a bit. I’ve made some lifelong friends through chance encounters – on trains, planes, buses, in doggy parks and supermarket queues. The kids say “Mum talks to everyone”, but I like to think that when two lives cross there’s a reason. Eva Rishan works as a doctor’s receptionist and we got chatting while I was waiting for my turn. 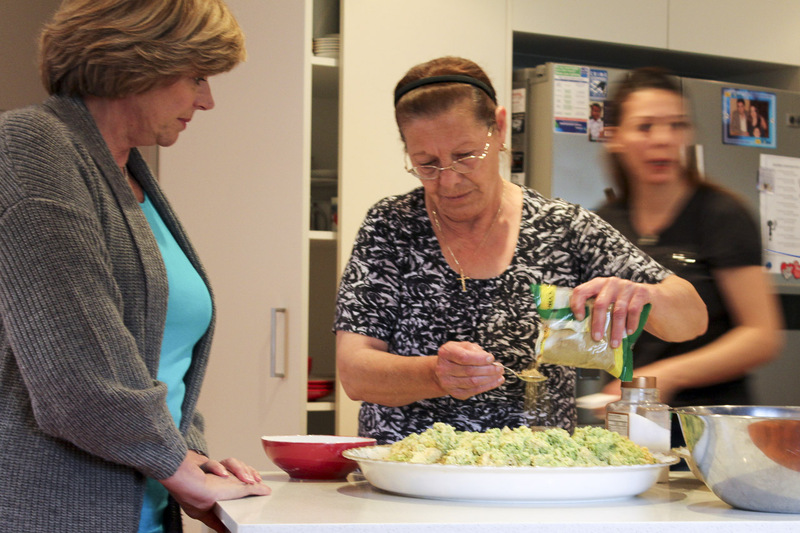 Eva was born in Syria, emigrated to Australia in 1989 and has since been joined by her parents, several siblings and their families. Eva invited me and my family to join her family for what she called a Syrian all day breakfast. Number one son James and I went early, so that Eva’s mother Renelle could show us how to make pita bread and falafel. Renelle’s English is limited but cooking is an international language and it wasn’t long before we were both busy chopping and mixing. The large back verandah has been enclosed with a corrugated iron roof and roll-down plastic blinds, in order to accommodate big family gatherings and keep the smokers out of the main house. Smoking – both ordinary cigarettes and flavoured tobacco smoke, inhaled through a hookah pipe – is still very popular among Syrians. The rest of our family (three) and the rest of Eva’s family (I lost count) arrived in time for lunch. There were over 30 of us altogether, including numerous kids. The mountain of pita bread was soon disappearing, filled with crispy warm falafel, hummus and a selection of pickles and salads. My contribution was an Apple Strudel which went down well for dessert with some strawberries and whipped cream. It was great fun to be part of a Syrian family for a day. 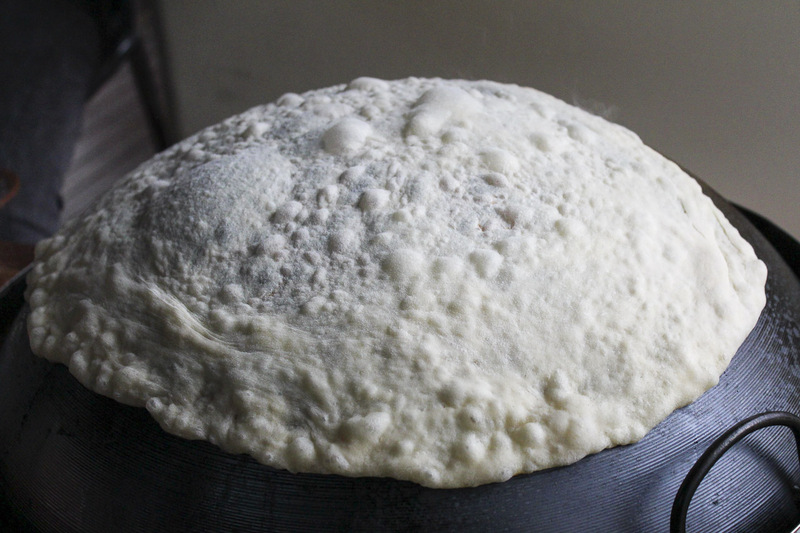 Mix yeast with warm water and put aside for 10 minutes. Place flour, salt and sugar in a bowl. 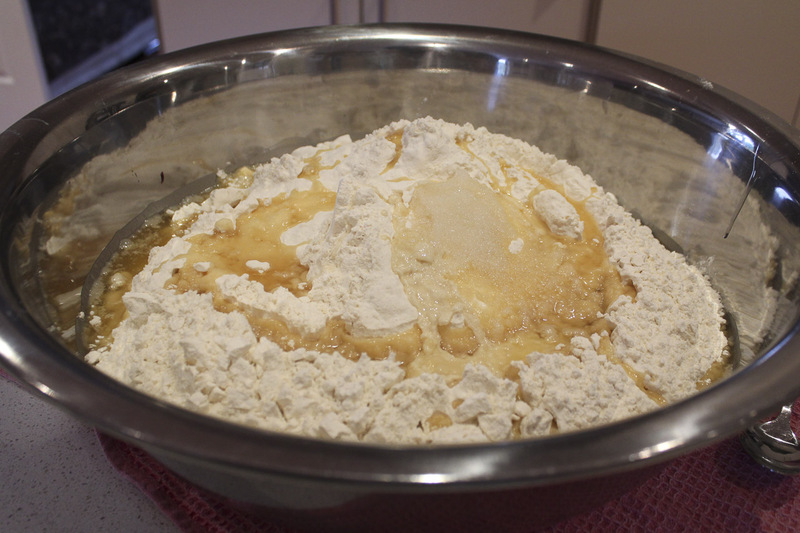 Make a well in the middle and add yeast mixture, gradually adding enough warm milk to hold the dough together. 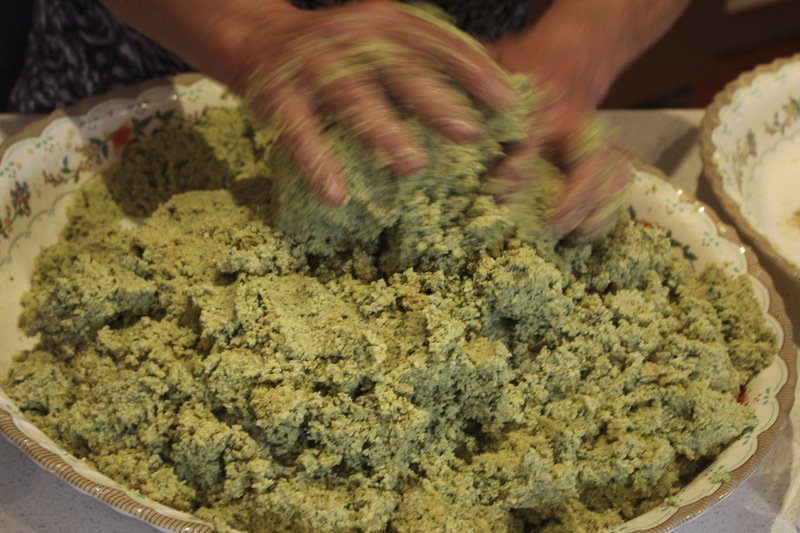 Knead dough until smooth and elastic but very slightly sticky, then leave in a bowl in a warm place – near a heater for example – covered with plastic wrap for an hour or two to rise, while you make the falafel. 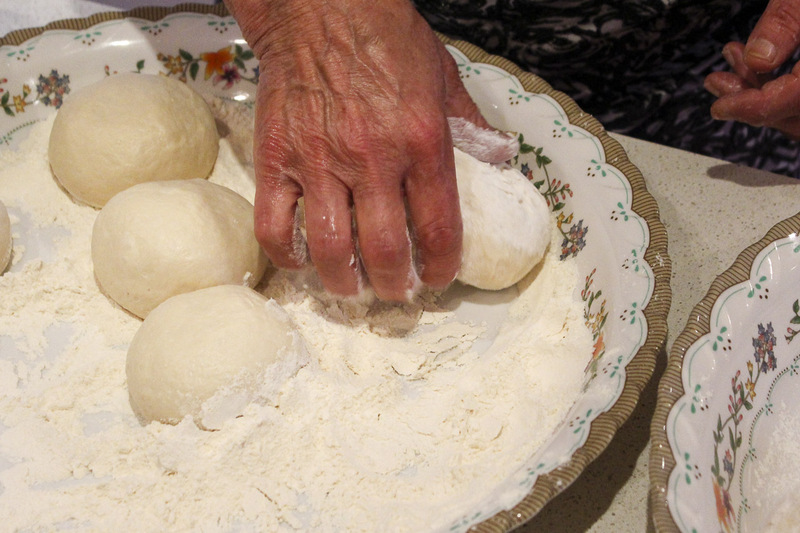 Cut dough into 12 and roll into balls. Preheat oven to it’s highest setting and heat up a pizza stone in the oven if you have one. 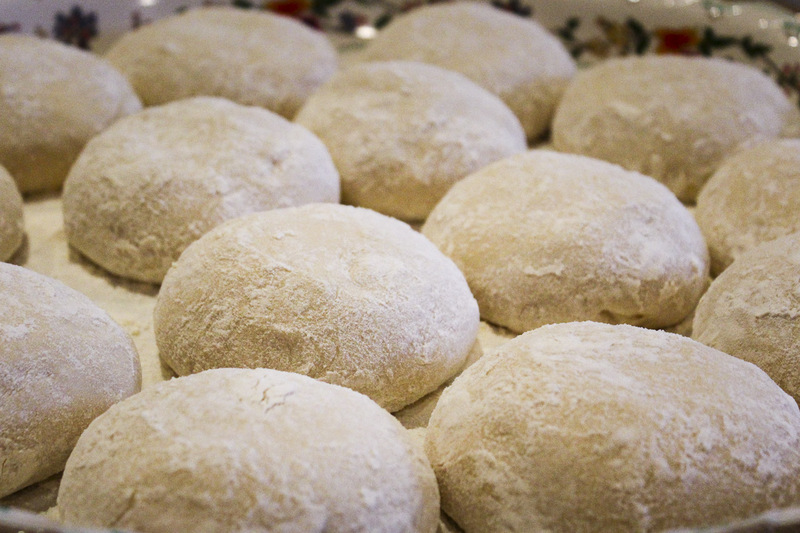 Roll out each ball to a circle about 20 cm in diameter, then bake for 5-10 mins or until puffed and slightly browned. This will result in pocket-style pita breads which you can fill with falafel and salad. 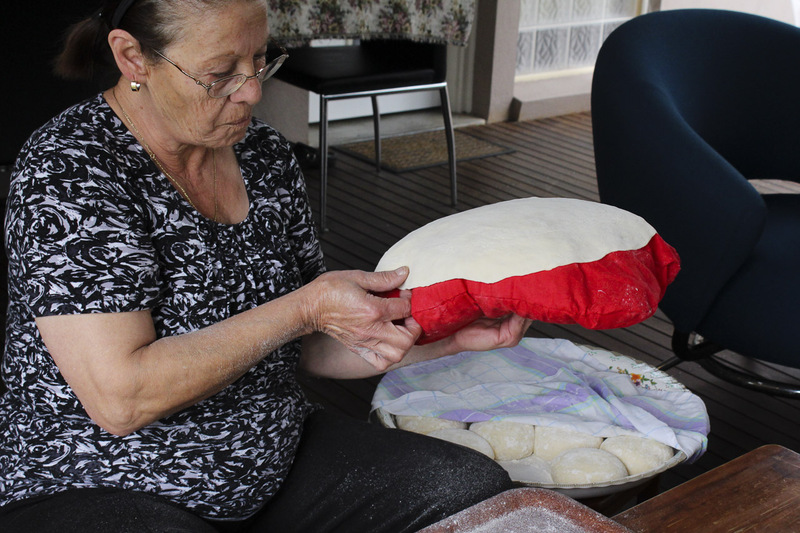 If preferred, stretch the circles out into much thinner pita breads, about 40 cm in diameter, as you can see in the photos. There’s quite a knack to this, but Renelle can do it in her sleep! These are rolled around the fillings like a wrap. 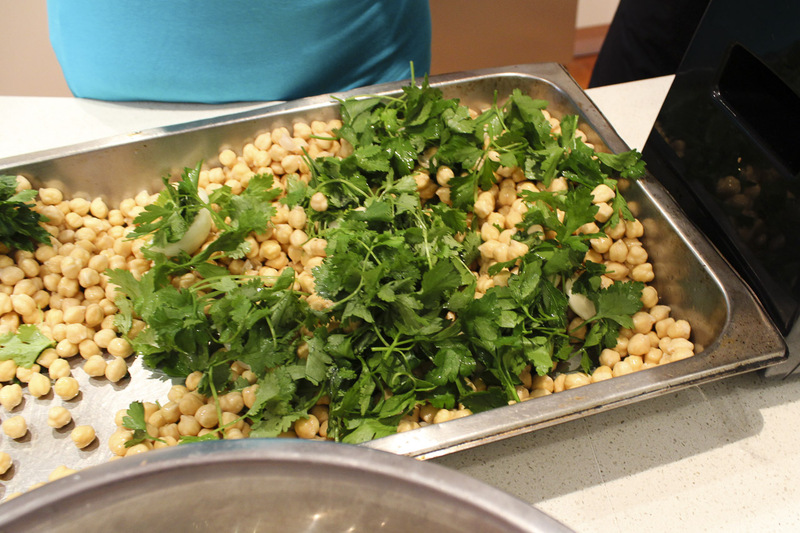 Place chickpeas in a bowl and cover generously with cold water. Mix in bicarbonate of soda and leave to soak overnight then drain. 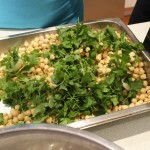 Using a food processor or a meat mincer, finely chop chick peas, onion, garlic, parsley and coriander. Add flour, salt, pepper, spices, extra bicarbonate of soda and oil. 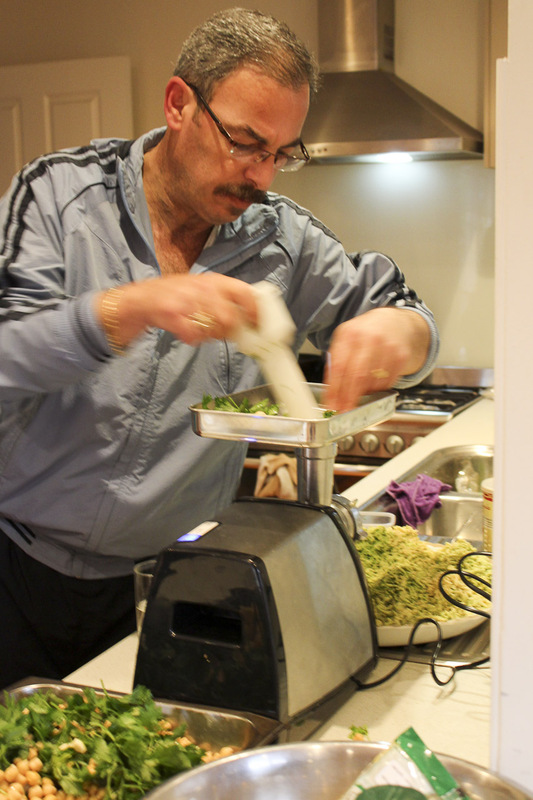 By hand or using a special gadget called a falafel scoop form mixture into small patties, dipping it into cold water between each. Heat 4-6cm oil in a large deep frying pan or wok. 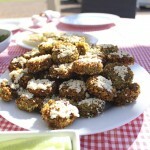 When hot fry falafel on both sides until golden, remove and drain, then roll immediately in sesame seeds. 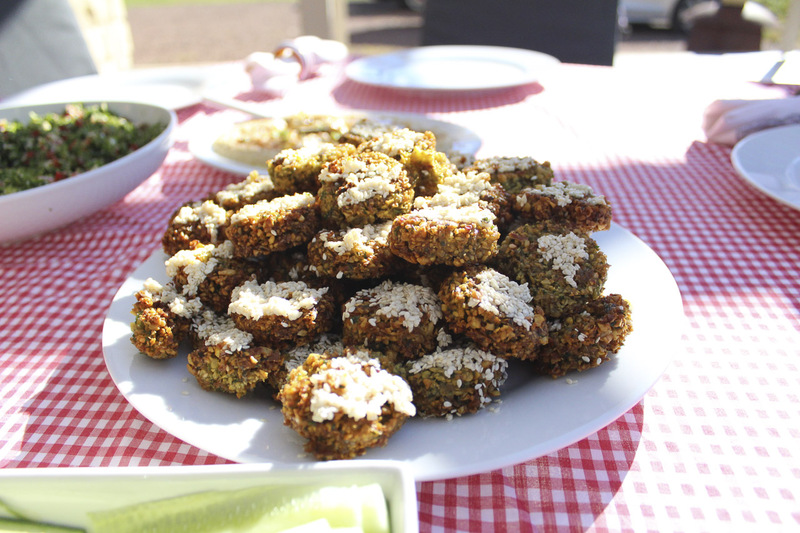 Don’t overcrowd the pan – falafel should cook quite quickly otherwise they will be dry. 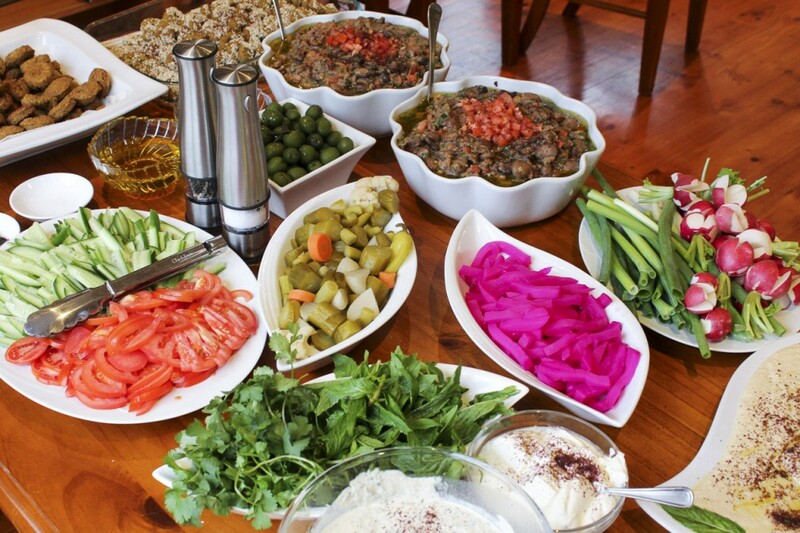 Serve warm with pita bread, salads and hummus. This recipe using canned chickpeas is quick to make and easy to halve. Place chick peas in food processor with remaining ingredients. Process, adding enough water to give the consistency of a dip. Keep in the fridge, covered, until needed. To serve, add a little water if Hummus has become too stiff, then spread onto a shallow dish and decorate with chopped parsley, toasted pine nuts, paprika and a drizzle of olive oil. The garnish is optional, but it looks and tastes great. Serve at room temperature with pita bread. 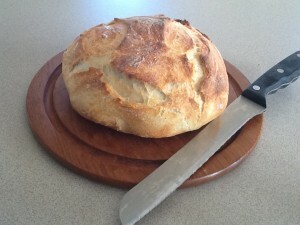 My son in law makes this “no-knead bread” all the time and says it’s so easy I thought it was time I had a go. The time involved in making it is less than five minutes, plus baking time – although you do need to start the dough the day before you need it. Minimum mess, quick and easy and tastes fantastic – just like a shop-bought ciabatta. If you look on Google you will find that there are heaps of variations of this recipe, though I believe it was first published in the New York Times (see video below). Here’s our version. Place all ingredients in a mixing bowl and mix thoroughly. Cover bowl with plastic wrap and leave at room temperature until you’re ready to bake the bread. In summer anywhere will do, but in the middle of winter it’s probably a good idea to put it somewhere cosy like the microwave or the oven, making sure you tell people not to switch it on! Recipes on Google vary on how long the dough needs to rise, so I reckon it’s fairly flexible. Anywhere between 12 and 24 hours you can go to the next stage. At this stage, i.e. after the 24 hour rising period, the dough can be refrigerated for up to 3-4 days and this time in the fridge actually improves the flavour of the bread. Place an iron pot with a lid in the oven – a le Creuset-type pot holding 6-8 litres – and turn the oven on to 250C or as high as it will go if it doesn’t go that high. 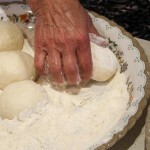 Meanwhile tip the bread dough out onto a floured surface. Fold and flip it over on itself a few times, then form into a ball with the seams underneath and place on a piece of baking paper. If you have time at this stage leave the loaf to rise for an hour before baking, in which case turn the oven on now. If the dough has been in the fridge for a couple of days then give it 2 hours to come to room temperature and rise before baking. When the oven is up to temperature use the paper to put the bread into the pot (I left it on the paper rather than inverting it in as they do in the video) and make two slashes in the top with a pair of scissors. Cover with the lid and bake for 30-40 minutes. Remove lid and bake for a further 5-10 minutes or until nicely browned. It depends on your oven how fast it browns, so keep an eye on it. In such a hot oven it browns fast. Remove and cool on a rack. When I was growing up in England, my mother usually had a freshly-baked cake waiting for us when we arrived home from school. Sometimes it was a butter cake, baked in a slab tin then iced with white icing and cut into rectangles with a glace cherry on each piece. Sometimes it was drop scones (pikelets), which we ate with butter and golden syrup. One of my favourites was bread pudding – quite different to bread and butter pudding, which uses cream and eggs and is served as a dessert. Although it’s called a pudding, we ate it as a cake, still warm from the oven. It’s an old recipe from World War 2, when nothing was wasted and many things, including eggs, were rationed. For a modern twist use chocolate chips instead of the dried fruit or a combination of the two. Soak bread in cold water for half an hour. Squeeze bread to expel as much water as possible, then beat with a fork to remove lumps. Mix all ingredients together and spread into a shallow baking tin about 20x30cm in size, lined with baking paper. Bake at 180°C for a good hour or until nicely browned. Sprinkle liberally with white sugar, cut into squares and serve warm. When we were living in South Africa in the late 80s, just before Mandela was released, we became friends with Johan van Heerden and his French wife Jacqueline. Johan continues to be one of South Africa’s leading sculptors. One Sunday they invited us for lunch and Jacqueline had made a delicious bread which she served with home made pâté. When I asked for the recipe, she said it was too embarrassing to give it to me, because it was SO easy! I told her it was just the kind of recipe I like – something which looks and tastes fantastic, but takes less than five minutes to make. The basic recipe is just buttermilk, self-raising flour and salt, but you can add anything which takes your fancy to make it more interesting. It’s best eaten the same day. Mix all ingredients. Put 2-3 Tbs water into the packet and shake to remove any remaining buttermilk stuck to the sides and add this to the mixture. Mixture should be like a stiff scone mixture. Add any extra ingredients – see below. Spoon roughly into a greased metal ring mold or a loaf tin for 45 mins at 180°C – don’t smooth it over. A ring mold is best because you get more crunchy edges. Eat the same day or freeze. Delicious toasted. Don’t be tempted to take it out too early – it may look cooked on the outside but might still be raw in the middle. If after 45 mins you’re not sure, stick a toothpick in the middle and check that it comes out clean.